1 C None No Power Seat 1 C is a standard recliner-style First Class seat located at a bulkhead. Full-stretching legroom might be limited due to the bulkhead, however, there is additional personal space due to the lack of a seat reclining in front. Floor storage for personal items is not available for use during takeoff and landing. The proximity to the galley and lavatory area might be bothersome. 1 D None No Power Seat 1 D is a standard recliner-style First Class seat located at a bulkhead. Full-stretching legroom might be limited due to the bulkhead, however, there is additional personal space due to the lack of a seat reclining in front. Floor storage for personal items is not available for use during takeoff and landing. The proximity to the galley and lavatory area might be bothersome. 4 C None No Power Seat 4 C is a standard recliner-style First Class seat in the last row of the section. A full bulkhead in back does not exist. A hanging cabin separator has been placed to separate the cabins. Interference such as noise, seat back bumping from accessing the seat behind, stretching legs, and accessing items stored under seat from the first row of the Main Cabin section might occur. 4 D None No Power Seat 4 D is a standard recliner-style First Class seat in the last row of the section. A full bulkhead in back does not exist. A hanging cabin separator has been placed to separate the cabins. 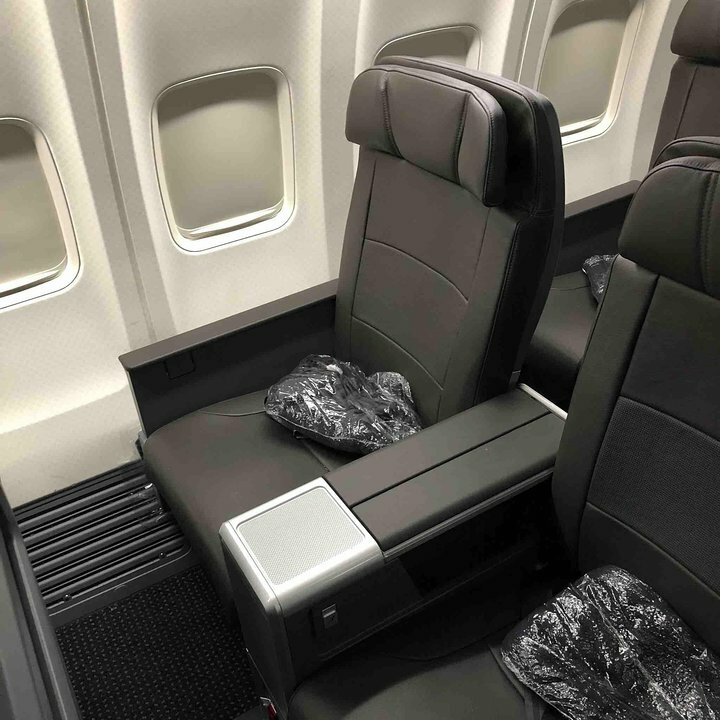 Interference such as noise, seat back bumping from accessing the seat behind, stretching legs, and accessing items stored under seat from the first row of the Main Cabin section might occur. A variety of music selections may be accessed through personal portable devices. A variety of film, television program, and video game selections may be accessed through personal portable devices. The new innovative seats allow for easy placement at a comfortable viewing position of personal portable devices. All seats in all classes of service on this aircraft feature access to regular AC power outlets. American Airlines is renfurbishing their existing Boeing 737-800 fleet to match their new Boeing 737 MAX 8. The aircraft is configured with First Class, Main Cabin Extra, and Main Cabin seating and is known in the industry as the Oasis Project. Main Cabin Extra is a standard Main Cabin Economy Class-style seat with additional legroom. 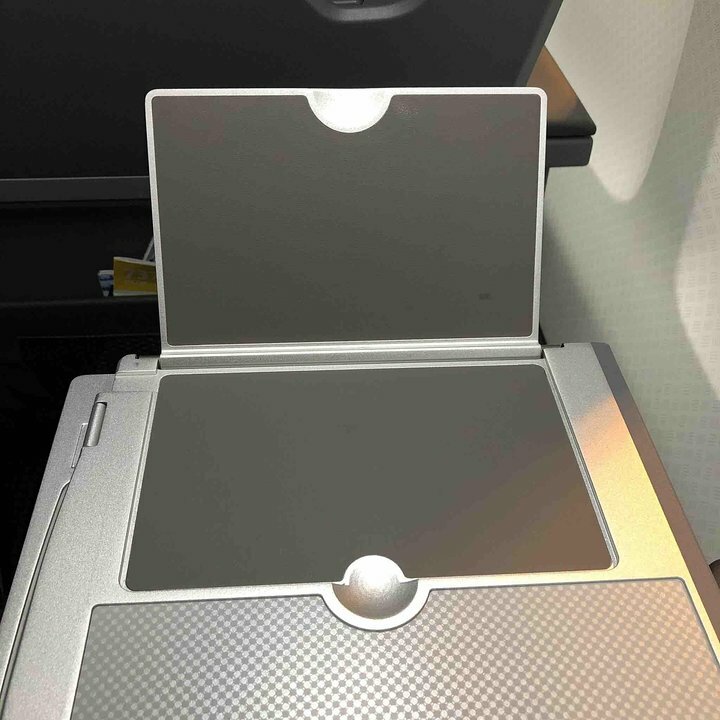 The standard seats in Main Cabin Extra and Main Cabin feature a redesign of the back literature pocket and tray table to provide additional legspace. 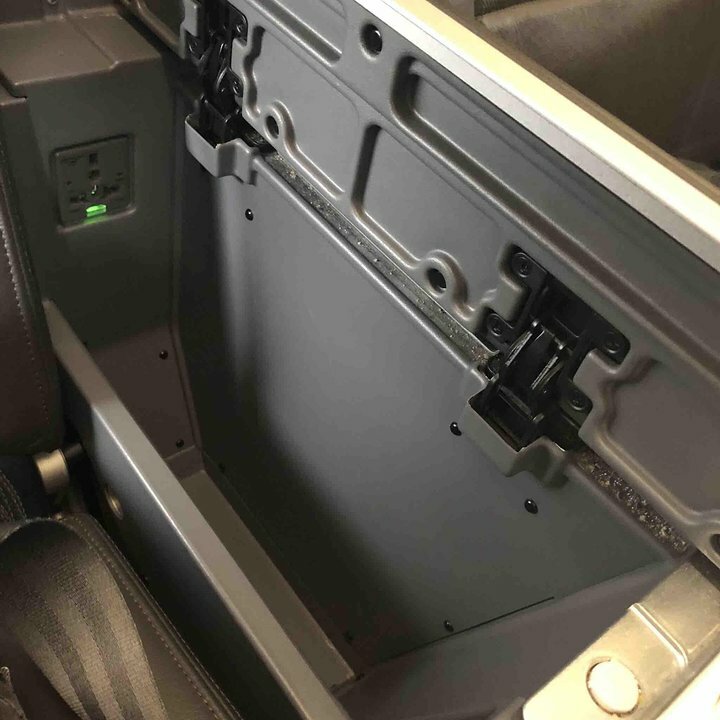 The seat also contains a drop-down tablet/personal device holder positioned at a comfortable viewing level. All entertainment on this aircraft is streamed, therefore, bring your own personal portable device. 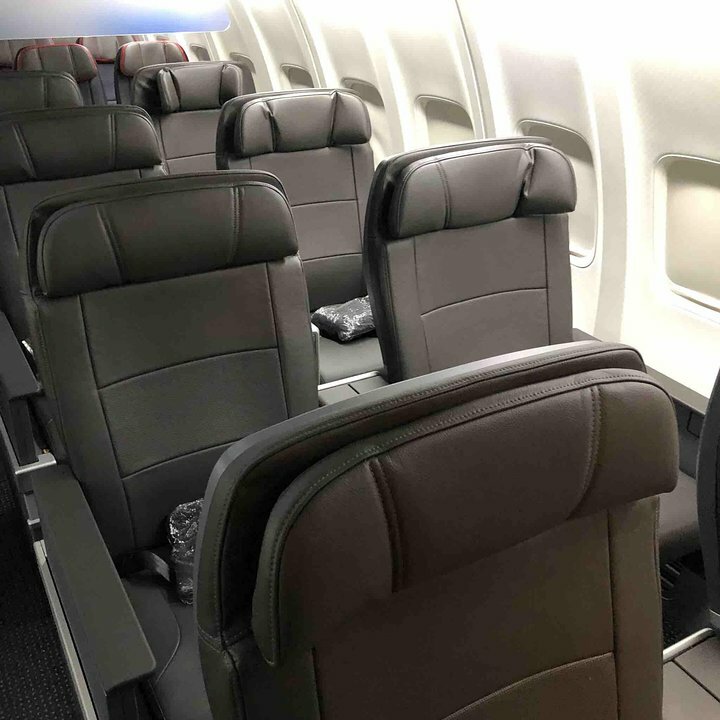 New seats in this plane 737-800, same seats as in new 737 MAX, in first class are EXTREMELY HARD even though they are wider. MUCH Less of a recline for 1st class seat EXTREMELY unconfortable especially for a long flight. Rest room TINY!!! This seat is NOT for anyone broad shouldered. It is jammed against the fuselage forcing me to sit crooked and forces me to lean into the center seat about 6”. Go for the aisle! Leg room is tight, but overall I think it's more comfortable than the old 737-800 configuration. Window and aisle seats no longer have IFE electrical boxes underneath the seats, although a small one remains under middle seats. The lavs are as bad as you've heard about. No window or cutout, little shoulder room due to missing cutout. This far back in the plane the window seats seem to have less leg room. It looks like the seats are angled slightly to match the curvature of the plane. In this seat the window frame matches up directly with your should. If you have broad shoulders this pushes you into the middle seat. Avoid windows in the rear on this plane. 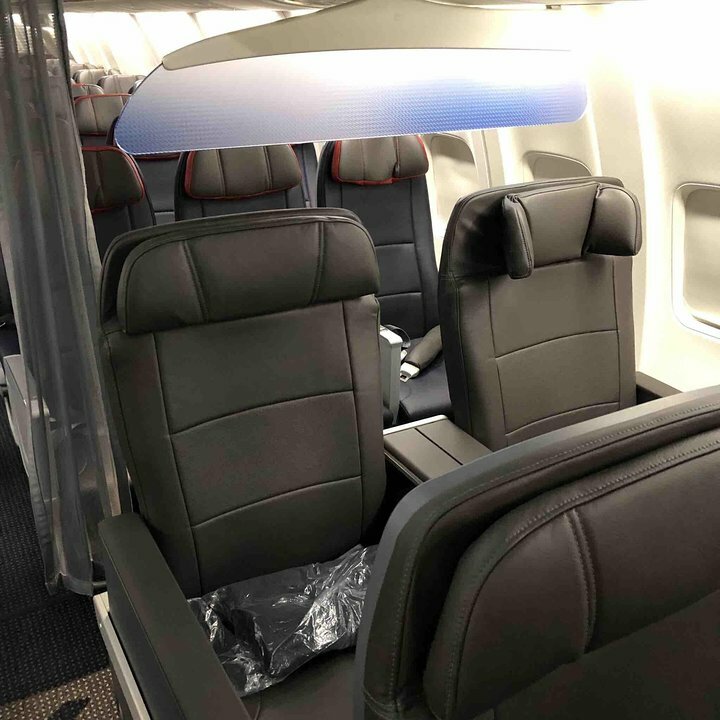 American Airlines flies 2 versions of Boeing 737-800 .